The photocells are MOFOB MOFB and presence detectors to detect obstacles in the optical axis between the transmitter (TX) and receiver (RX), type D according to EN 12453. They are used for doors and automatic doors. These devices are equipped with the communication system that allows BlueBUS easily connect to all devices with central two wires only, simply connect in parallel bridges and selecting the address as the required function. Dimming circuit that prevents interference between the detectors and automatic synchronization between different pairs of photocells. The adjustable version allows MOFOB focused compensate for differences up to 30 °. 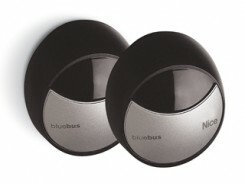 Connects technology motion detectors BlueBUS (photocells and MOFOB MOFB) to power that have tickets to contact traditional photocells. The system automatically acquires the network devices connected to the BlueBUS.